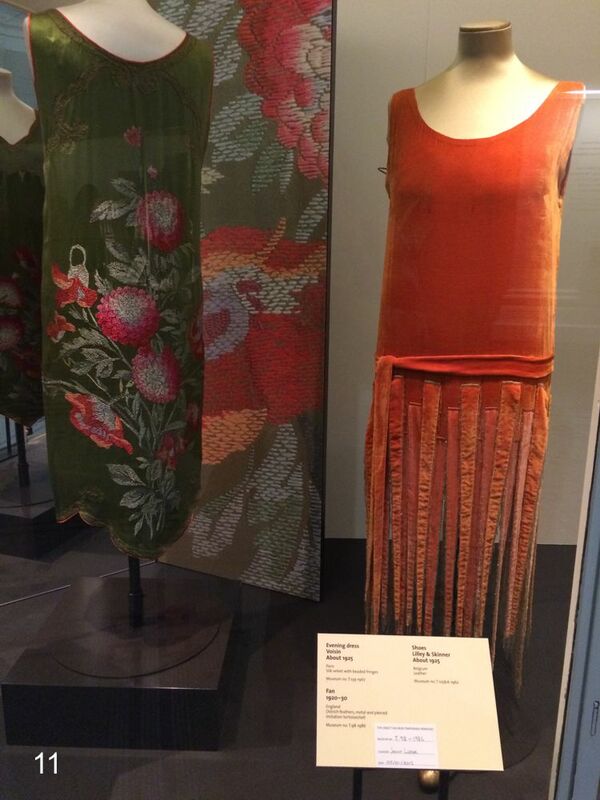 For me it is a priority to visit the Victoria and Albert Museum every time I go back to England. I have seen so many amazing exhibits here. 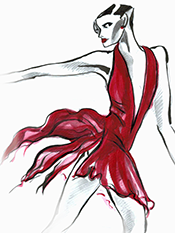 First and foremost for Clothing – Fashion, Theatrical and dance costumes. 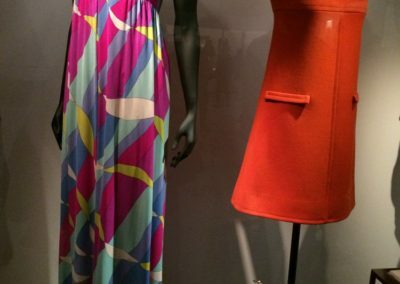 The fashion gallery now has so many Fashions that they have to rotate the exhibits. As a student we visited behind the scenes where they log and care for all the clothing. 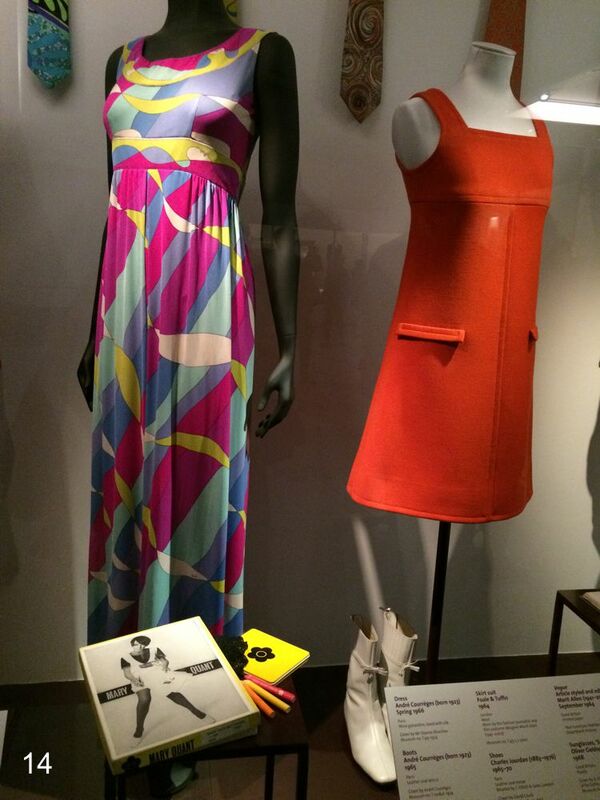 We saw the most famous designers garments inside and out. Examining first hand how they were constructed in fine detail. 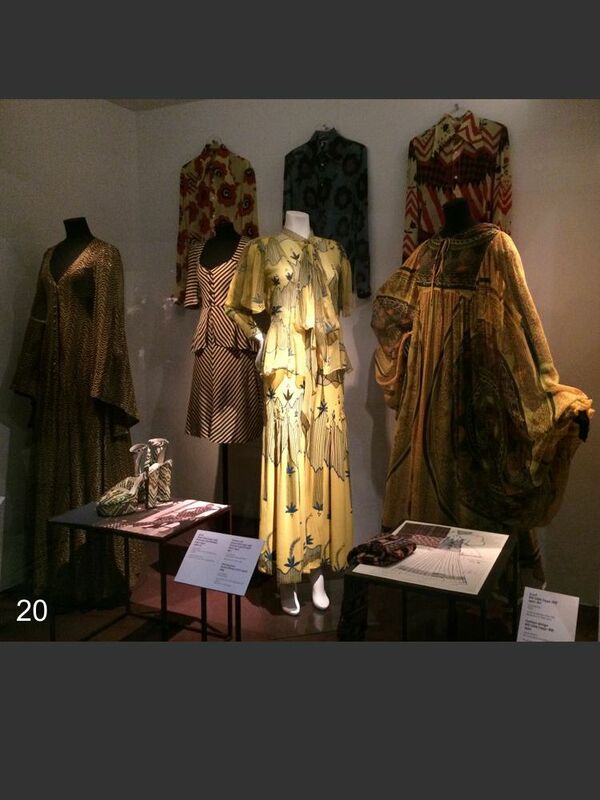 The V&A hold many lectures/talks about their historical costumes. 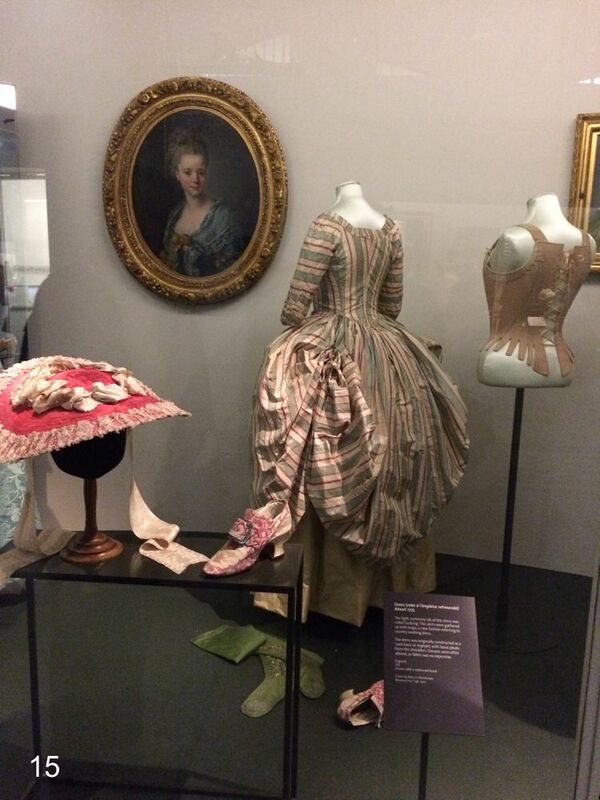 Please enjoy these lovely historical fashions from one of my favorite London Museums. Silk fan painted in a design of yellow pansies. Carved mother-of-pearl sticks from the trochus shell of the trochidae family. The leaf of this fan carries the signature of Ronot-Tutin. He was a French fan painter who specialised in floral fan leaves. The top part of leaf is painted silk gauze, with a panel of bobbin lace below. Although Ronot-Tutin has painted the pansies very realistically, their bright colour and size were not in keeping with French tastes at the time. He may have made this fan for an English customer, or for someone who wanted a fan to match a very particular dress. 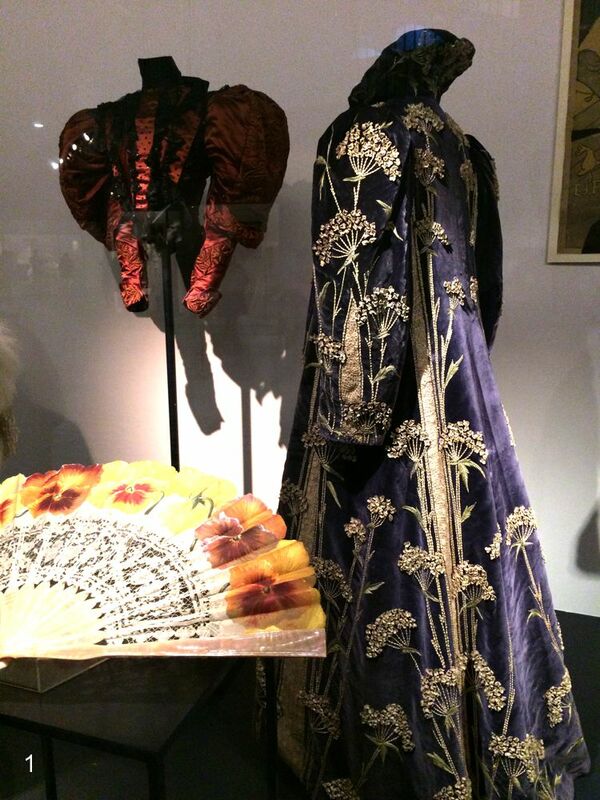 Purple velvet coat with a medieval-styled collar and white satin and lace panels. 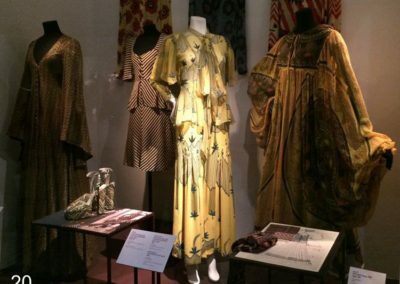 It is entirely covered in dramatic sprays of sweet cicely (Myrrhis odorata) embroidered in yellow and green silks in feather-stitch and couched work, and with petals of white felt and applied by means of a French knot in the centre worked in yellow silk. The coat is full length with a close fitting bodice, flared skirt cut in one piece, leg of mutton sleeves and a rounded stand-up collar. The main part of the coat is made up of five panels of velvet which are joined together by insertions of cream-coloured machine-made lace backed with cream-coloured silk. The sleeves have similar insertion. 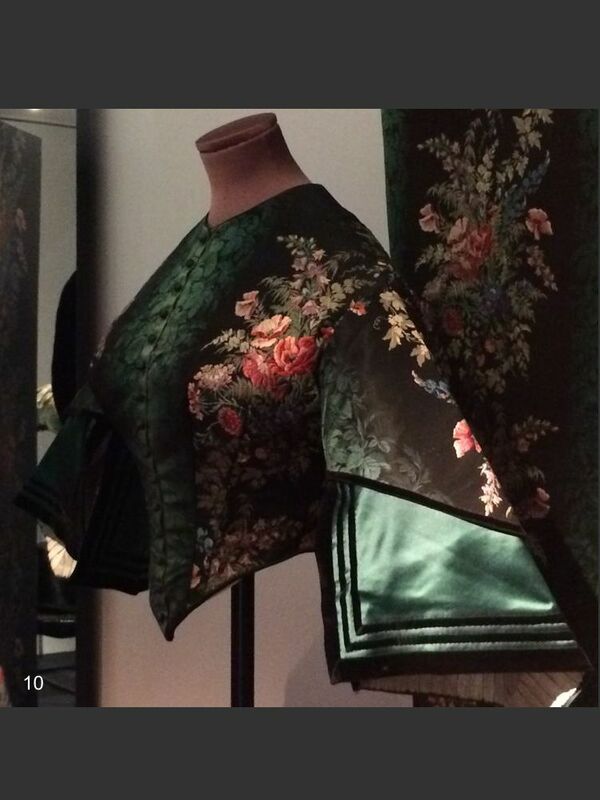 The velvet panels and sleeves are heavily embroidered with a design of stylised hydrangeas. The coat is lined with cream-coloured silk and there is an inner lining of a woollen gauze-like fabric. The collar is lined with canvas and stiffened with wires. The coat fastens down the front with hooks and eyes. 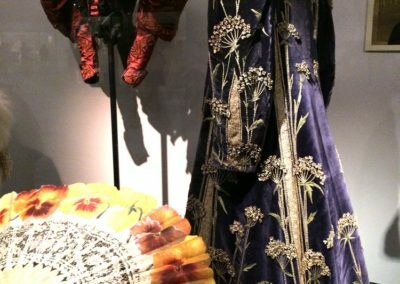 One of the sleeves has a trimming of machine-made lace. 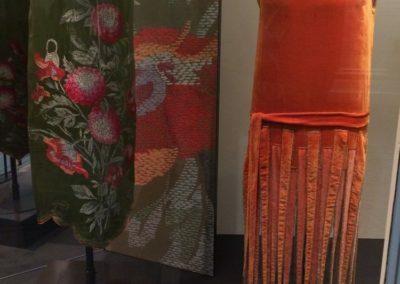 This coat reflects the influence of the European Arts and Crafts Movement. It features a medieval-style collar and is entirely covered in dramatic sprays of an English wildflower called Sweet Cicely hand-embroidered in yellow and green silk, with petals of white felt. 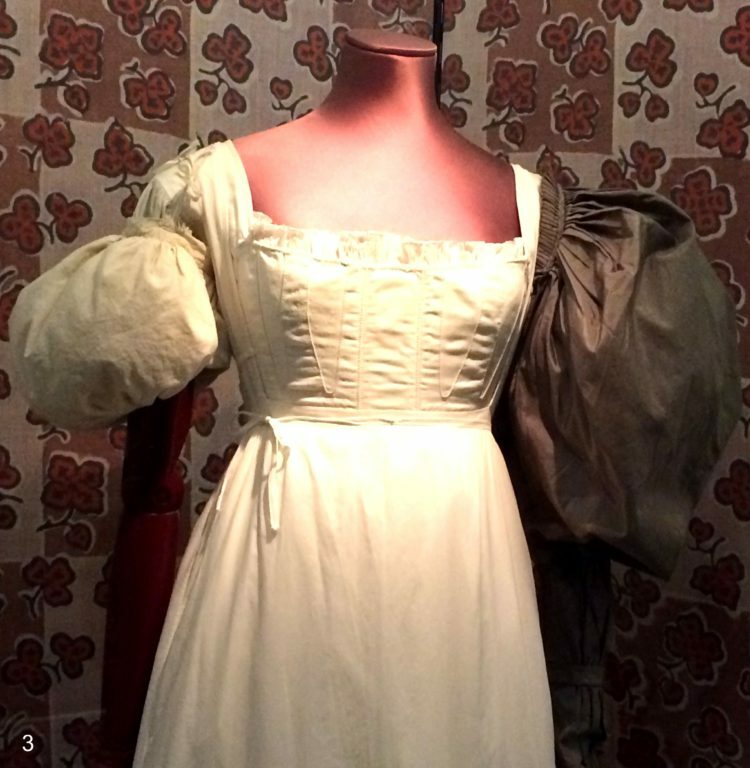 Enormous sleeves swell out from the bodice of this day dress. They create an exaggerated shoulder line and emphasise the smallness of the wearerís waist. 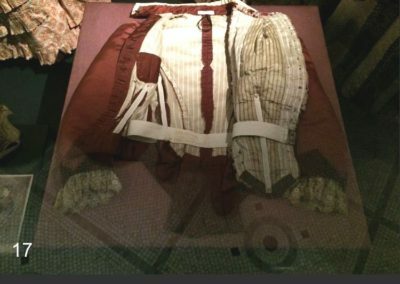 Known as ëgigotí (ëleg-of-muttoní) sleeves, they were highly fashionable between 1894 and 1896 when women adopted them for all types of activities and occasions. The basic shape was similar to that of sleeves during the 1830s. Like those sleeves they rapidly diminished in size after a few years. Bodice of silk satin decorated with raised embroidery and metal beads, and trimmed with black sequined net. Lined with silk and whalebone strips. 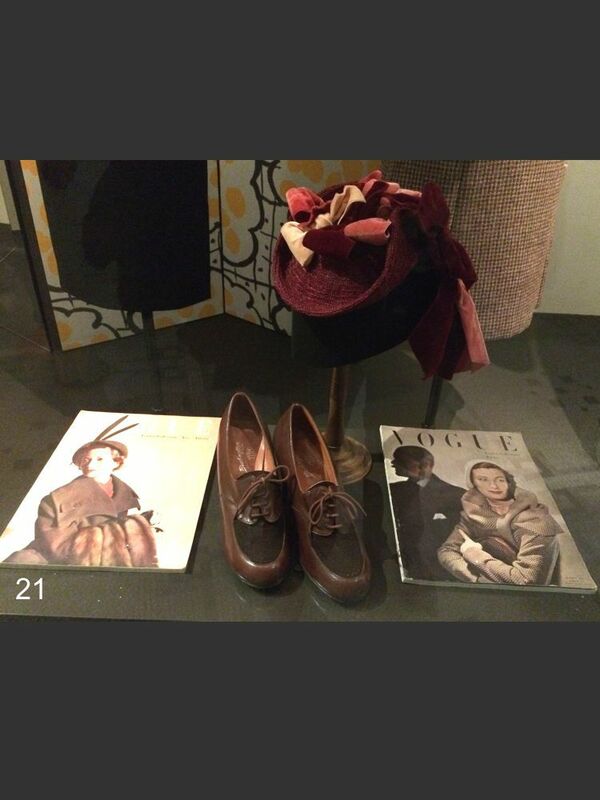 It has a high stand collar trimmed at the back with a brown silk satin bow. The black waistband is also finished with a bow at the front and back. 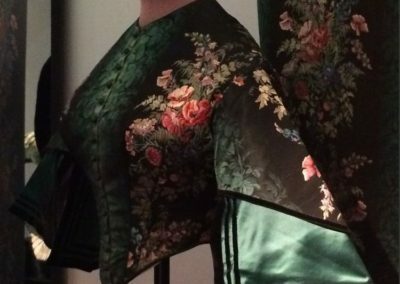 The raised embroidery is in a floral pattern. Fragment piece of sleeve fabric of silk satin embroidered with silk and metal beads. The shift has short sleeves and a frilled neckline. 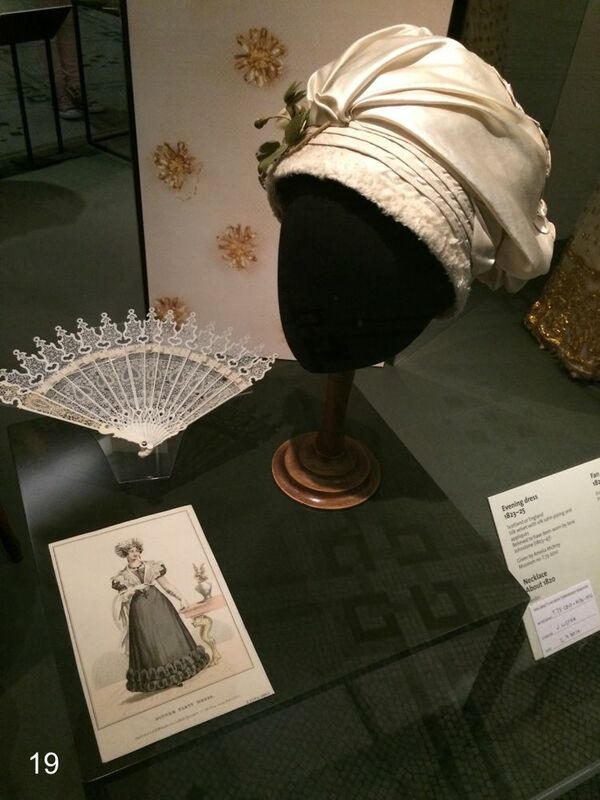 This ensemble illustrates the items of underwear that women wore in the 1830s. The shift had been an essential element of underwear for centuries and remained so in the 19th century. 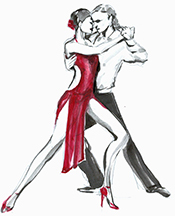 At that time it was more politely referred to by its French name, chemise. 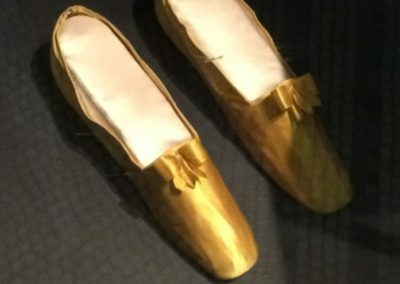 When the sheer fabrics and rather clinging styles of Neo-classical dress became fashionable in the 1790s, drawers were introduced into the female wardrobe for the sake of modesty. 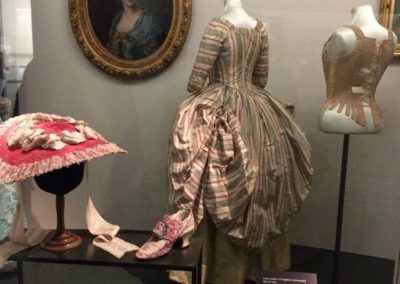 They continued to be worn when 19th century dresses evolved into more substantial styles. The corset is lightly boned and reinforced with cording. There is a long narrow pocket in the front for the busk, a wide piece of wood or ivory, which kept the corset stiff and flat in front. 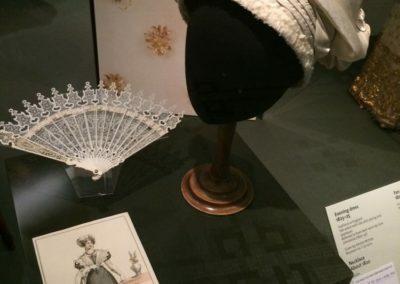 This ensemble illustrates the items of underwear worn by women in the 1830s. The shift had been an essential element of underwear for centuries and remained so in the 19th century. 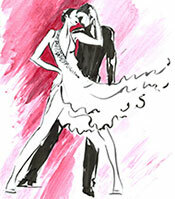 At that time it was more politely referred to by its French name, chemise. 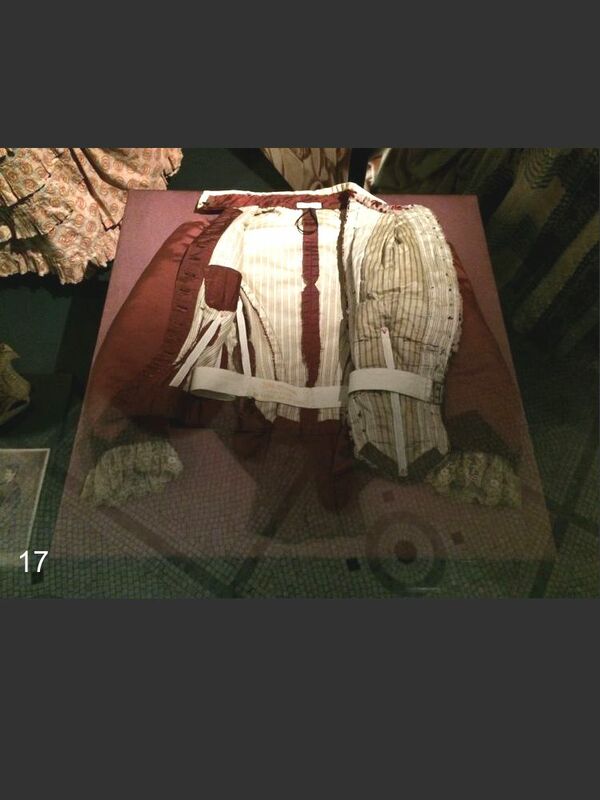 When the sheer fabrics and rather clinging styles of Neo-classical dress became fashionable in the 1790s, drawers were introduced into the female wardrobe for the sake of modesty. 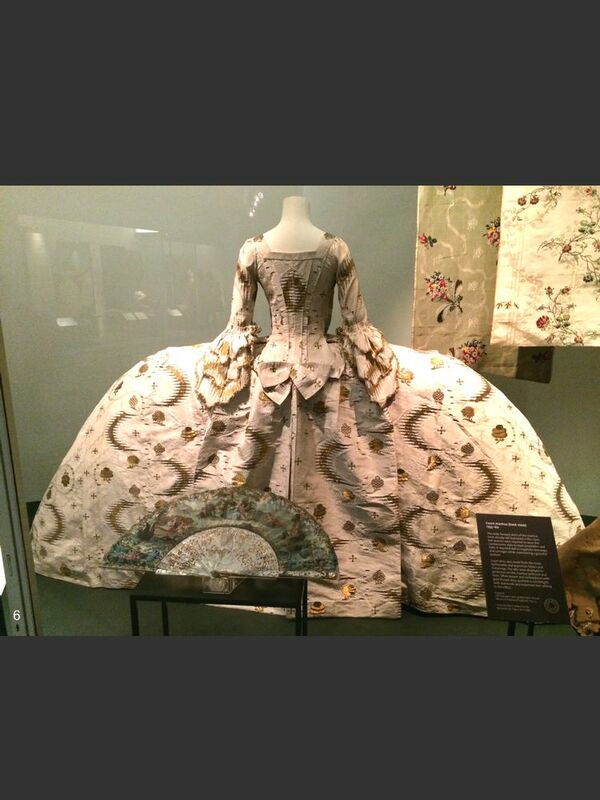 They continued to be worn when 19th century dresses evolved into more substantial styles. The corset is lightly boned and reinforced with cording. There is a long narrow pocket in the front for the busk, a wide piece of wood or ivory, which kept the corset stiff and flat in front. Drawers of hand sewn cotton. 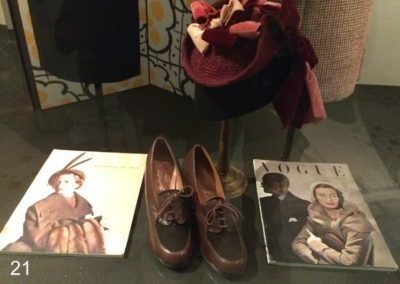 The legs are mid-calf length, trimmed with tucks. The legs are cut separately and on the cross, and lapping over one another at the waistband which is adjusted with a draw tape. 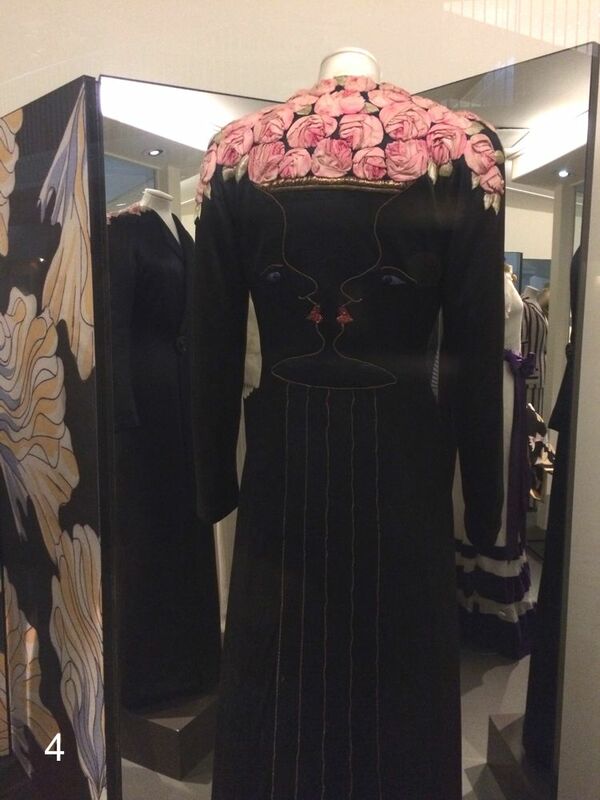 This superb evening coat is one of the best examples of Elsa Schiaparelli close artistic collaboration with the French artist, poet and film maker Jean Cocteau (1889-1963). Cocteau produced two drawings for Schiaparelli which were translated into designs for a jacket and this evening coat for the Autumn 1937 collection. The design for the evening coat reveals Cocteau’s preoccupation with the double image, a motif he consistently returned to in his work. The double image held particular fascination for several other artists associated with the Surrealist movement, including DalÌ. 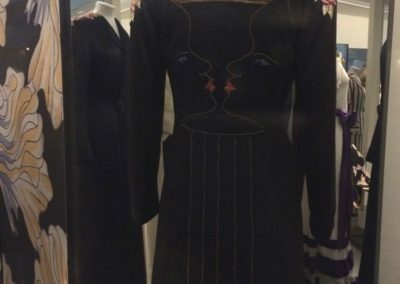 The strong linear design on this coat can be read as two profiles facing each other, and in the negative space, a vase of roses standing on a fluted column. 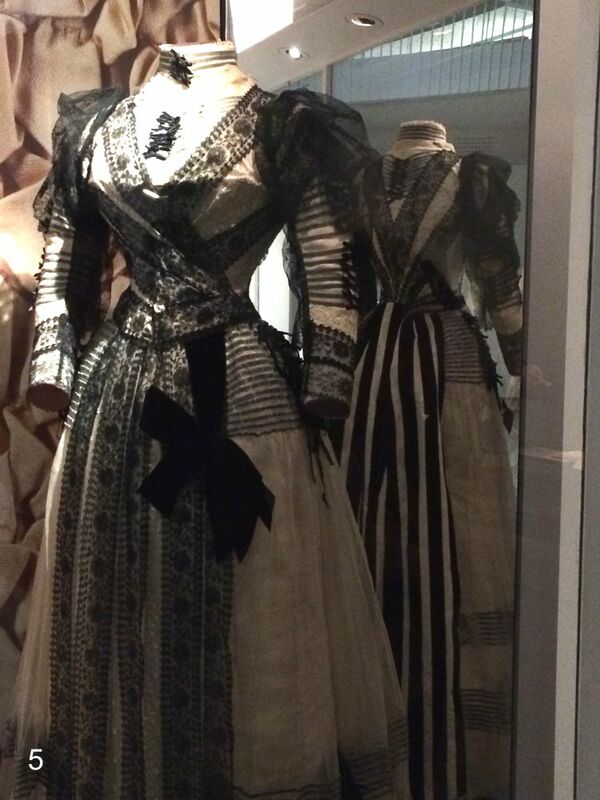 This dress features a high, upstanding collar, which is a distinctive and fashionable feature of 1880s daywear. The sleeves sit close to the line of the body, as opposed to the 1890s when they were exaggerated into a ‘leg of mutton’ shape. The body itself is curvy, with an emphasised hourglass waist created by a rigid whalebone corset.It is elaborately trimmed. Many high-end dressmakers of the late 19th century emulated the work of the House of Worth, which produced the most luxurious gowns created from bold French silks, combined with ingenious design touches in embroidery, lace and chiffon.It was worn by one of the two Rogers sisters, Cara or Anna, daughters of a wealthy American industrialist. Cara Rogers later became Lady Fairhaven – she was a ‘Dollar Princess’, one of several heiresses who came to Britain in the late 19th century, and married into the British aristocracy bringing much-needed glamour and financial capital. 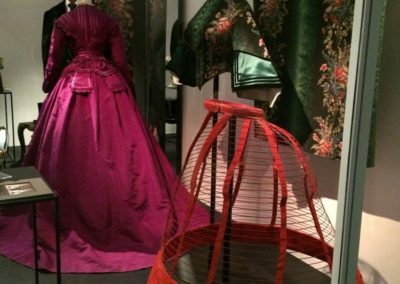 Lady Fairhaven kept several spectacular outfits bought in Paris and New York for her sister and herself in the 1880s and 1890s. 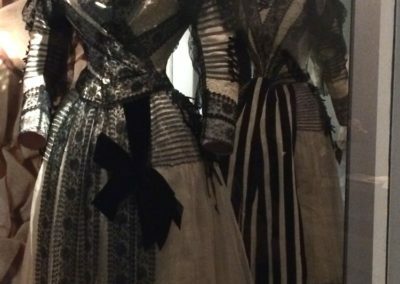 Formal day jacket bodice and skirt constructed from ivory coloured figured silk overlaid with chiffon encasing strips of black velvet ribbon, with bands of black machine lace, and with a panel of vertically striped black and ivory velvet at the centre back forming a bustle shape. 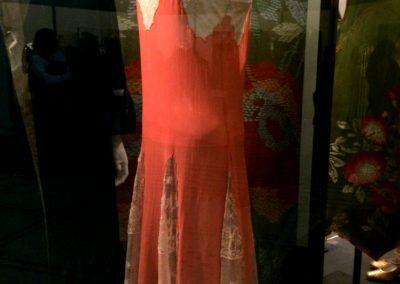 Stitch marks suggest that there may have been an additional panel of lace or drapery applied over the back of the dress. Probably a half-mourning dress. Petticoat made of rose-pink georgette trimmed with ecru machine-made lace. 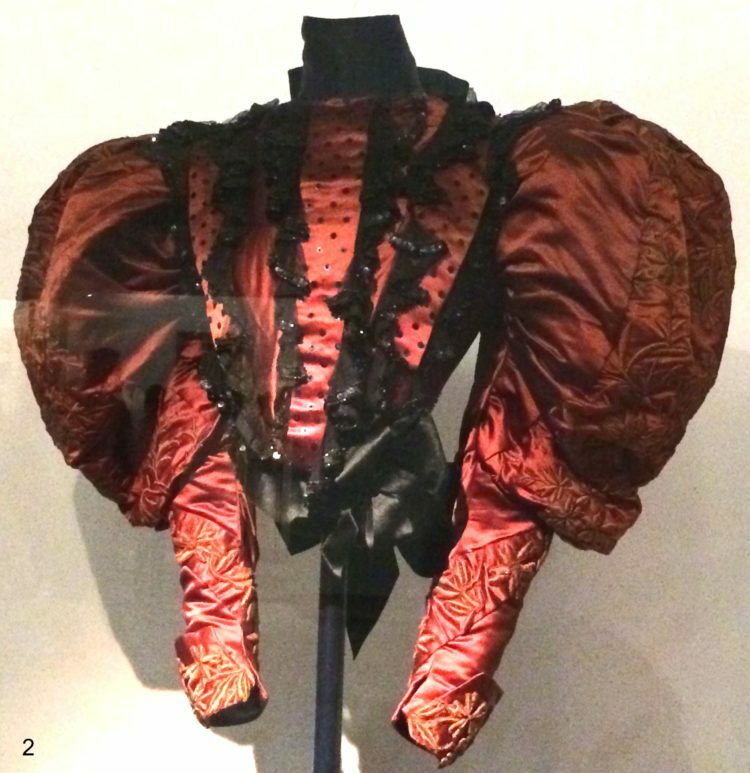 The garment is knee length and straight cut except where scalloped insertions of coffee-coloured machine-made lace give additional fullness at the bust, and six panels are inserted in the skirt. With matching georgette shoulder straps. Hand-stitched. 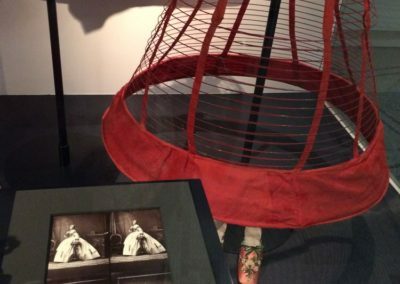 Crinoline ‘A Favorite Of The Empress’ consisting of a spring steel frame covered with red wool and linen, probably made in Great Britain, 1860-1865. 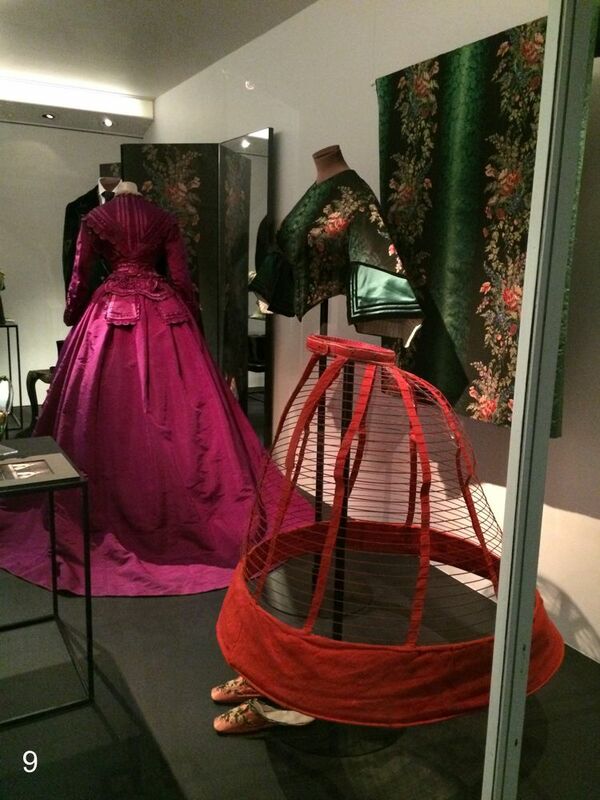 Crinoline consisting of a spring steel frame covered with red wool and linen. Red and white striped woven waistband fastened with stamped metal hooks and eyes, and to the back of which is attached a semi-circular red wool back panel lined with white cotton and machine stitched in white from which hang a red diamond pattern woven woollen tapes which are threaded spring steels covered with braid woven wool which wrap over to fasten with a brass metal clamp in front. The hoops reach from the sides around the back to knee level and from there to the base and around the whole of the body. The outline is circular with extra fullness at the back. The bottom row of steels are covered with a red wool ‘skirt’. Extra fullness is created at the top back with half hoops. 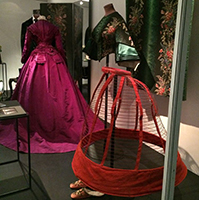 The word ‘crinoline’ was first used in the 1840s to describe petticoats lined with horsehair cloth. 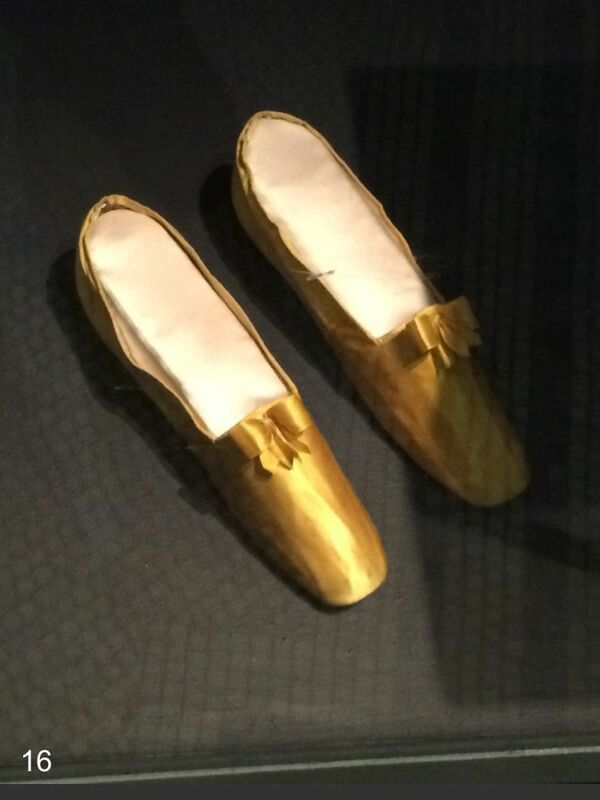 These were worn with up to 8 petticoats to help support the fashionable wide skirt. Sometimes padding had to be used to give the correct shape. By 1856, ever widening skirts meant the weight of these petticoats became very uncomfortable. Attempts were made to solve this problem, including petticoats made from inflatable rubber tubes. These were a failure owing to unexpected punctures! 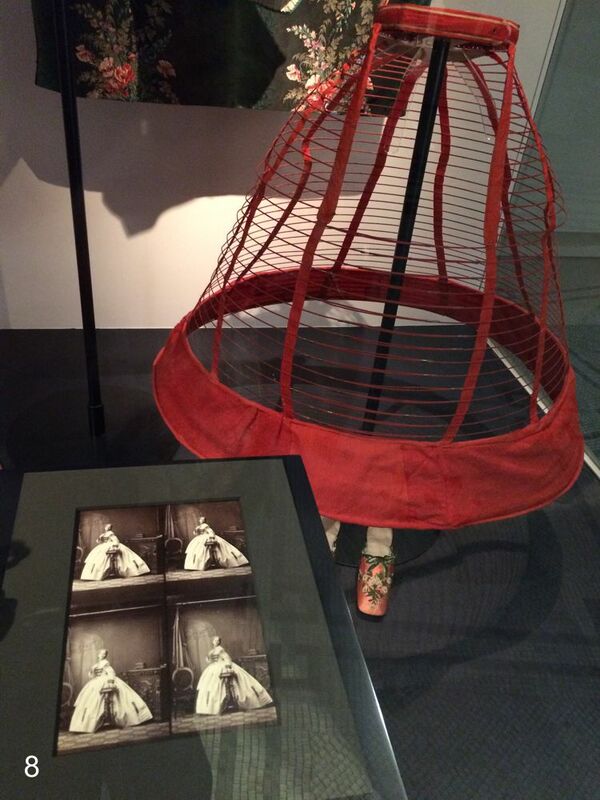 The ‘artificial’, or ‘cage’ crinoline appeared in 1857 as a welcome and more practical alternative. It was made of spring steel hoops, increasing in diameter towards the bottom and connected with tapes. The earliest cage crinolines were bell-shaped. 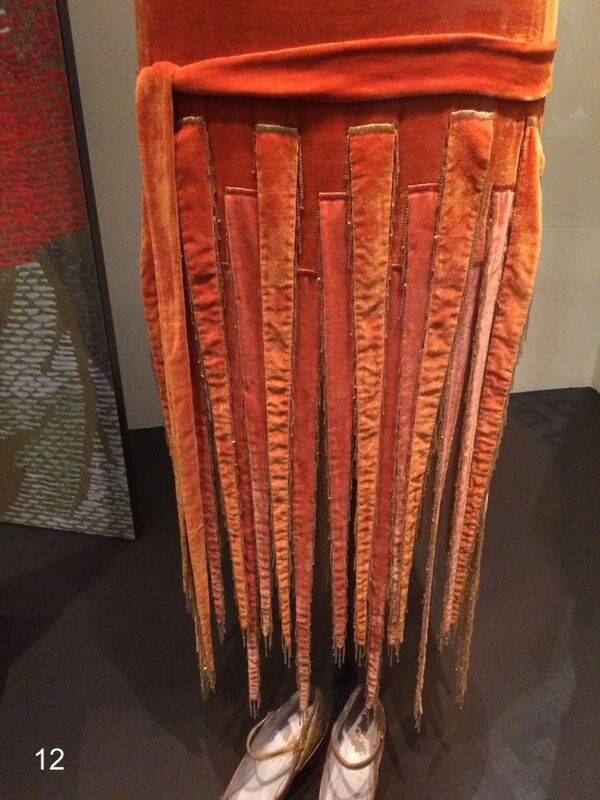 This short dancing dress is made from orange silk velvet. It has a sleeveless bodice that is straight cut and low waisted. 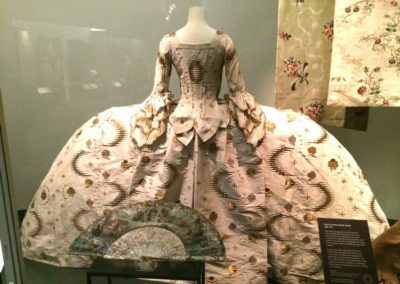 The skirt is composed of two rows of knee-length streamers tapering to a point, each decoratively stitched to the bodice. The topmost is made of orange velvet stitched in beige, the lower of peach velvet stitched in pink. Each streamer is edged with a gold bead fringe, and lined with bright yellow silk. 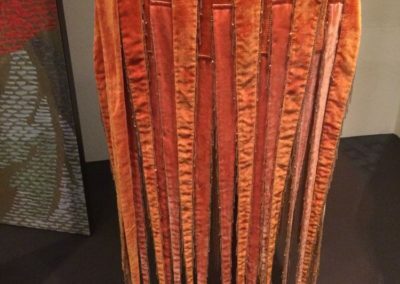 The belt is a narrow sash in an orange self material doubled with a peach velvet that matches the lower set of streamers. 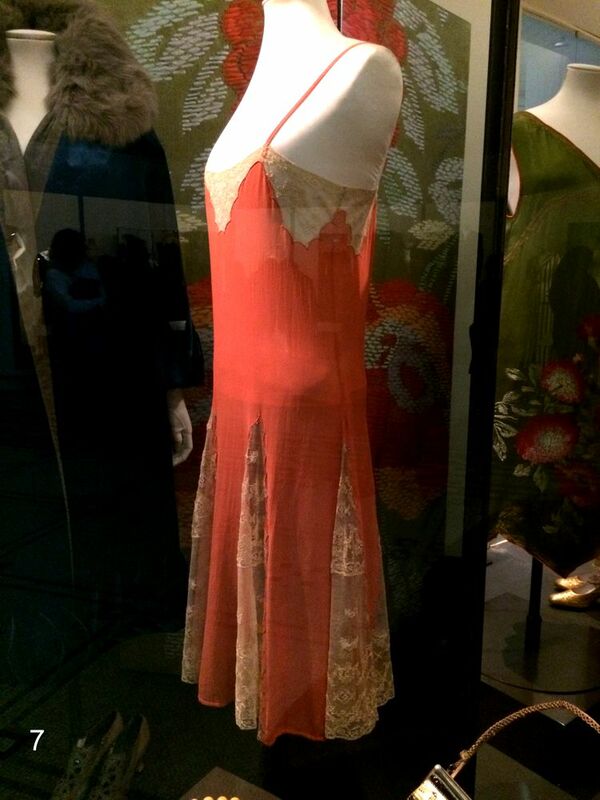 The dress is unlined but the neck and armholes are faced with narrow bands of matching satin. Voisin of Paris made it about 1925. 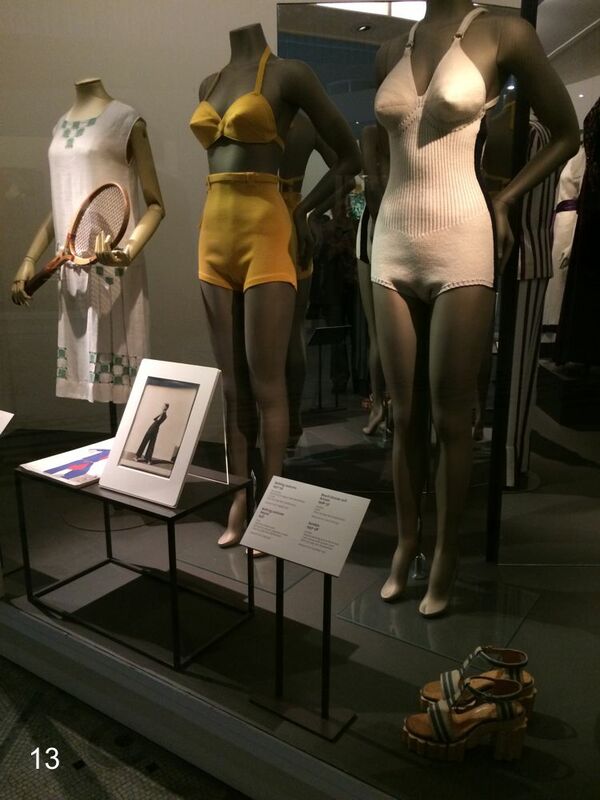 Bathing costume made of machine-knitted wool. Made in one-piece. White with a navy stripe down both sides. The straps cross over at the low cut back and through two chrome D loops at the front. Unlined. Made in stocking stitch with a ribbed waist panel. The bust is fashioned.